Polaris docked in Tornio where it bunkered LNG fuel for the first time on 2 February. 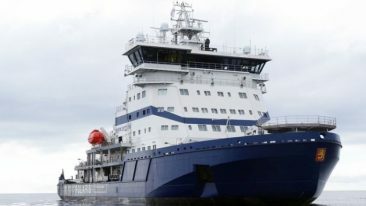 Polaris is the world’s first LNG-powered icebreaker and will assist vessels navigating the icy conditions in the Bothnian Bay, the northernmost part of the Baltic Sea. Polaris assisting a vessel in the Bothnian Bay last March. LNG is currently the cleanest fuel in shipping. 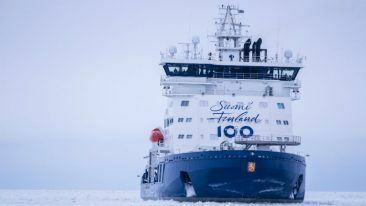 One of the world’s first ship owners to adopt the fuel was and Finnish state-owned icebreaker fleet operator Arctia. This is the third winter in the demanding, icy conditions of the northern Baltic Sea for the world’s first LNG-powered icebreaker. 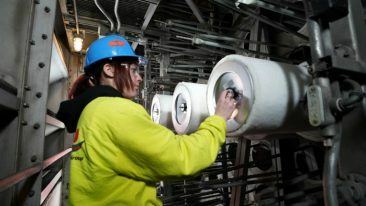 Tornio MangaLNG is the Nordic regions’ largest LNG receiving terminal and, due to its northern location, the use of the cleaner fuel can now be increased in the Bothnian Bay. 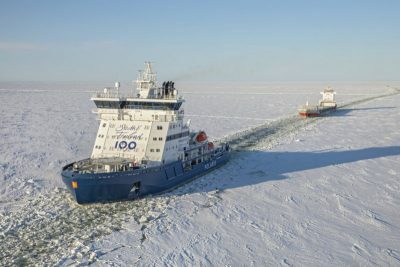 There have been recent developments also for two other Arctia ice breakers, with MSV Fennica and Northwest Passage record-holder MSV Nordica having both been Polar Code-certified with a Polar Class 3 notation. This puts the two vessels among the very few in the world to have such a high ice class notation, which signifies compliance with the International Maritime Organisations’ (IMO) regulations on ice navigation, ship design, safety and environmental footprint in polar waters.